Issue 6.11 is now online! – mvMORPH: A package of multivariate phylogenetic comparative methods for the R statistical environment which allows fitting a range of multivariate evolutionary models under a maximum-likelihood criterion. Its use can be extended to any biological data set with one or multiple covarying continuous traits. – Low-cost soil CO2 efflux and point concentration sensing systems: The authors use commercially available, low-cost and low-power non-dispersive infrared (NDIR) CO2 sensors to develop a soil CO2 efflux system and a point CO2 concentration system. Their methods enable terrestrial ecologists to substantially improve the characterization of CO2 fluxes and concentrations in heterogeneous environments. This month’s Open Access article comes from Jolyon Troscianko and Martin Stevens. In ‘Image calibration and analysis toolbox – a free software suite for objectively measuring reflectance, colour and pattern‘ they introduce a toolbox that can convert images to correspond to the visual system (cone-catch values) of a wide range of animals, enabling human and non-human visual systems to be modelled. The toolbox is freely available as an addition to the open source ImageJ software and will considerably enhance the appropriate use of digital cameras across multiple areas of biology. In particular, researchers aiming to quantify animal and plant visual signals will find this useful. This article received some media attention upon Early View publication over the summer. You can read the Press Release about it here. It seems that from the number of submissions we receive at the journal, Methods in Ecology and Evolution has filled an important niche. As our editor-in-chief, Rob Freckleton, wrote to introduce our second volume: “those doing science need to be kept up to date on new approaches, and those developing new methods need a place to publish, as well as be supported in getting their methods used”. The journal appears to have done just that: not only have we published some very popular articles (see our recent posts on 2011 top cited papers part 1, part 2 and part 3) but we have also seen a keen interest from our authors in utilising the online extras that we offer to disseminate their work. As always, in issue 3.1 we cover a very broad range of articles – the scope includes everything from statistics, to ecophysiology and stable isotope methods. The applications of the methods are as varied as reconstructing snow depth surfaces, tracking migratory songbirds, estimating immigration in neutral communities and assessing the effects of watershed and reach characteristics on riverine assemblages. Being the first issue of the year all content is free to access. A video by Brett Favaro on TRAPCAM, an inexpensive camera system for studying deep-water animals. A tutorial by Jeff Powell on his molecular approach to species identification. Our first Open Access article by Erica Spotswood and colleagues, How safe is mist netting? Evaluating the risk of injury and mortality to birds, attracted a lot media attention. You can read the press coverage for this article on our News and Highlights page. This issue also contains a free phylogenetic application: MOTMOT, a model of trait macroevolution on trees by Gavin Thomas and Rob Freckleton. Check out our Applications page describing the latest software tools. It’s worth remembering that all Applications are free. Finally, Mitch Eaton and William Link provided the catchy photograph that make this issue’s front cover. You can read more about the cover on a separate post, available tomorrow! 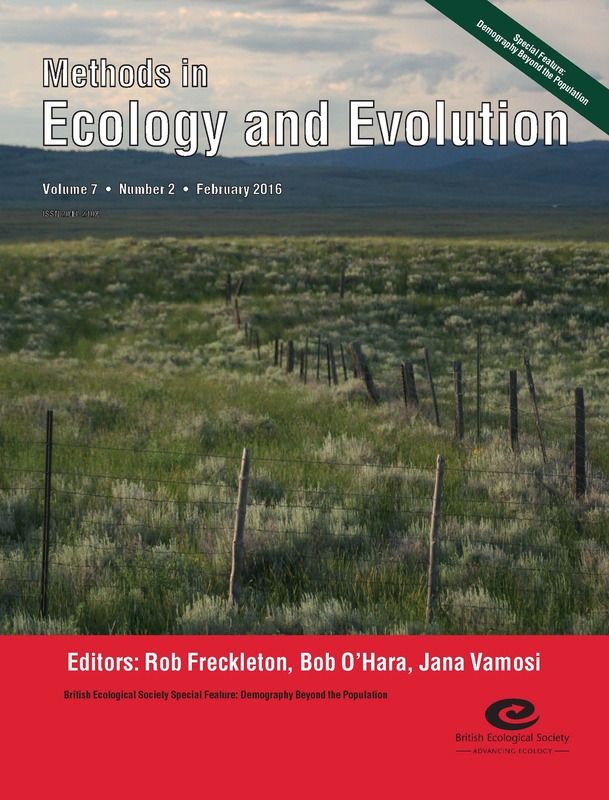 Today we look at part 2 of our most cited papers in Methods in Ecology and Evolution in 2011. Our most cited papers on statistical methods in ecology and evolution, modelling species and the environment, and physiological ecology were covered in part 1 – and finally tomorrow we’ll look at our top papers in population monitoring, climate change, evolutionary ecology and phylogenomics. Our last issue for 2011 is out. Issue 2.6 is packed with the latest methodological developments. We have four new articles on monitoring: from positional accuracy in the field by Mike Dodd to distance sampling butterflies by Nick Isaac and colleagues, to how to account for non-independent detection of individuals by Julien Martin and collaborators and, finally, to a class of spatial capture-recapture models for ‘search-encounter’ data by Andrew Royle, Marc Kéry and Jérôme Guélat. Two articles focus on modelling distributions. Darryl MacKenzie and colleagues present their work on modelling habitat and species distribution dynamics and Peter Wilson introduces an analytical framework applying a distance-based approach to the ordination and analysis of maps produced by species distribution modelling tools. Kristen L. Granger and collaborators explain their extraction and assay methods on seed chemistry while Adam Davis et al look at seed predation rates. Also, Joseph Chipperfield et al model dispersal kernels, Alexandre Bec and co-authors assess the reliability of fatty acid–specific stable isotope analysis for trophic studies. Jeroen Groot and Walter Rossing review recent developments in systems modelling which support learning by creating a salient diversity of management alternatives and by translating science-based results into stakeholder perspectives. 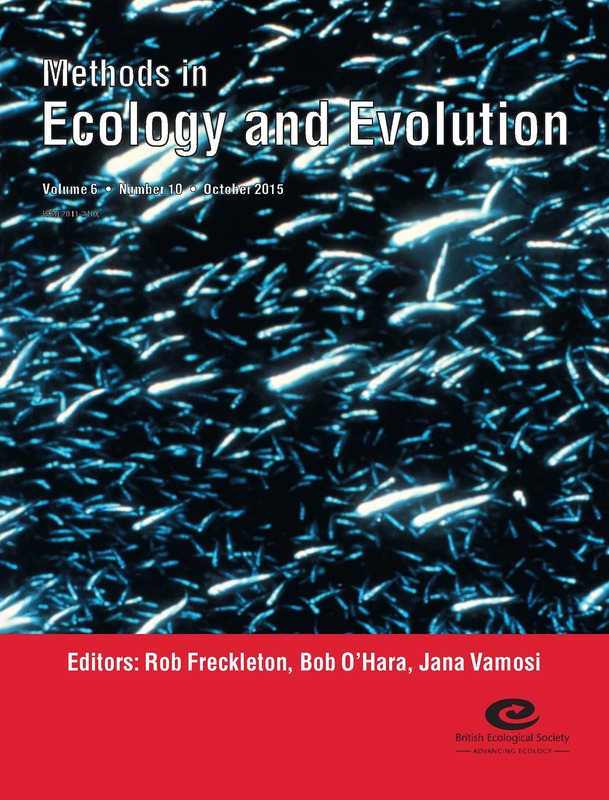 Nicholas J. Gotelli, Werner Ulrich and Fernando T. Maestre explore randomization tests for quantifying species importance to ecosystem function and their article takes the front cover. Finally, the issue contains two free Application articles. In the first Conrad Stack, Luke Harmon and Brian O’Meara detail RBrownie, an R package for testing hypotheses about rates of evolutionary change. In the second, Stefan Prost and Christian Anderson present TempNet, a method to display statistical parsimony networks for heterochronous DNA sequence data. Ask your librarian to get free access in perpetuity to the first two years of Methods in Ecology and Evolution by completing this request form or learn about how to access the journal in 2012. Here’s part 2 of our look at Methods in Ecology and Evolution’s most highly cited papers to date! We covered statistical methods in ecology and evolution, modelling species and the environment, and physiological ecology in part 1 of our look at our most popular papers so far – and on Monday we’ll be rounding off with our top papers in population monitoring, climate change, evolutionary ecology and phylogenetics.